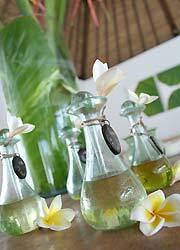 Bali Spa It is located on Oberoi Street in Seminyak. A stylish spa with unique futures of the natural interiors by trees and plants and a huge treatment villa for a guest is bvilla + Spa. Recovering health by improving ability of natural cure requires living well-balanced daily life. Based on the motto, they only use fresh organic products. A very gentle, soothing massage blending various hand techniques and easing movements of muscle and joints. By using palm strokes, it settles the body and increases blood circulation. Using traditional Hindu techniques passed down from generations of our ancestry, this massage focuses on pressure points using delicate thumb technique to relieve tension and stiffness in your back and shoulder muscular system. Our therapist performs a combination of strokes & techniques to help the body achieve a balanced state of equilibrium. Each stage is a combination of long, sweeping forearm and palm strokes refreshing the entire body. Tired from a long journey and a hectic schedule? This combination of lengthy palm strokes helps you to regain strength and release tired muscles. With a gentle stretching in a middle of the sessions, it will leave your body feeling rejuvenated. Remove muscle stiffness through head to toes for 90 min. 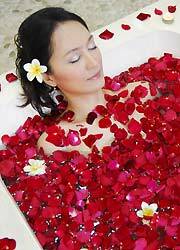 treatment, and improve blood circulation and enhance body self cure. It’s Special Massage of massage and finger pressure combination. Apply head, neck and shoulder stiffness treatment for 30 min. Cure headache and upper body tiredness by desk-work. A wonderful tingling sensation will be felt as the sea salt draws toxins out of your skin, the result is an all over healthy glow and noticeable energy improvement. A traditional recipe from our great ancestors making your skin silky smooth and helping to maintain a youthful appearance. Includes freshly mixed aromatherapy oils to enhance the effects and increase your power levels. Lift-up skin by fresh young coconut scrub. Cleansing skin and give natural moisture and brightness. The treatment includes Milk Bath. Very good for normal to oily skin, this treatment aids in the removal of toxins and dead skin cells, promoting healthy skin, and leaving you feeling revived. The course including massage, chocolate body scrub, polish, bath. Transportation service is not available. Please check car charter page! Children can wait in the lobby or the treatment room. There are menus for children over age 14. 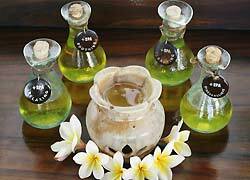 ※All massage treatment including original blend oil and tropical flower foot bath. ※Hand & Foot Treatment including massage. The spa is very beautiful and the service to customers was great. I felt very comfortable. I got my body stiffness getting worse and sometimes painful, however my head felt good and fresh after the treatment. Although sometimes painful, I felt very comfortable and fell asleep during the treatment. Make up room is well equipped. I really felt good relax body and mind in the relaxing space.